Butlers Bingo Mobile | You Have £30 Bonus Cash Here! 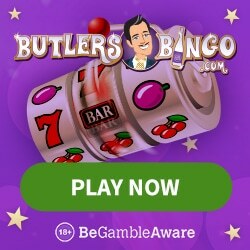 Butler’s Bingo launched in 2010 with the excellent software genius of Microgaming, quickly making an impression in the busy market, and the mobile version maintains these high standards of service. It has a generous welcome package, doesn’t require a download, is easy to navigate around, and although the promotions available are limited, there’s plenty of other gameplay to keep you entertained on the go. Butler’s Bingo mobile platform uses HTML5 so you just need to search for the website’s URL, and register or log in, and save to your home screen if you want to access it quickly in future – the mobile version works well on all iPad’s and iPhone’s, and Androids and tablets, but obviously, you need to have internet coverage for this to work! Registering can be done from your desktop or mobile and is an easy process with just basic details required, and you don’t need to enter your credit card details to get access to the site, but it’s recommended you make a small deposit in order to get the complete benefits of the new player welcome package. With plenty of Bingo, Slots and Casino games available, if you like what you see, and decide to make a deposit, you’ll get an additional 300% bonus on your first payment, plus 100 free spins! 300% welcome bonus on first deposit. 100 free spins when you become a funded player. Loyalty points redeemed for cash. VIP benefits such as reload bonuses and extra free spins. There is also a very active Facebook page with loads of competitions and giveaways, plus promo codes which apply to the desktop and mobile versions. There are five Bingo rooms to choose from with the mobile version, offering multiplayer 90 ball Bingo, all the fun and excitement of speed Bingo, and quite a few free Bingo options too. It pays to be a regular player and gain VIP status here as you’ll get all sorts of special benefits including cash back rewards and free gameplay, but there is also daily, weekly, and monthly guaranteed jackpot games for everyone offering up to £10,000 in prizes. Because it’s a popular site, there is also a large and fun community that you can get engaged with – or not! There are plenty of chat games available too so you can build up those bonus bucks to convert into serious playing power! Of course, you can pre-purchase all games to make sure you don’t miss out wherever you are, and whatever you’re doing. Butler’s mobile version offers all the best Slots and Casino games from the desktop site, and because the software is so impressive these are really cool and ooze state of the art technology! With access to video Poker, Blackjack, and Roulette you’ll feel like you’re in Vegas – albeit a really small version! And just because you’re on the move it doesn’t mean you can’t be in to win up to a million pounds with the Slots progressive jackpots like Mega Moolah and Cash Splash 5 Reel. I reckon Butler’s Bingo is one of the best mobile Bingo sites around, and is a fine alternative to its main desktop version. It’s easy to access, has a great £30 bonus and the ability to claim 100 extra spins when you make your first deposit. More importantly, the technology is second to none, there is a wide range of games to play, a fun community, and some really big prizes on offer – the only concern is trying to keep your cool on the tube if you win that £10,000 jackpot!